I was recently asked to create a christening gift for a little boy as a present to remember his day. I have done a few of these as gifts for babies detailing the day, time and weight along with their names as a keepsake. BUT this was one was a request with a difference. DINOSAUR’S were to be involved! My son has a triptych in his room I painted of a T-Rex which is in my portfolio! (Slight difference to my hearts!) 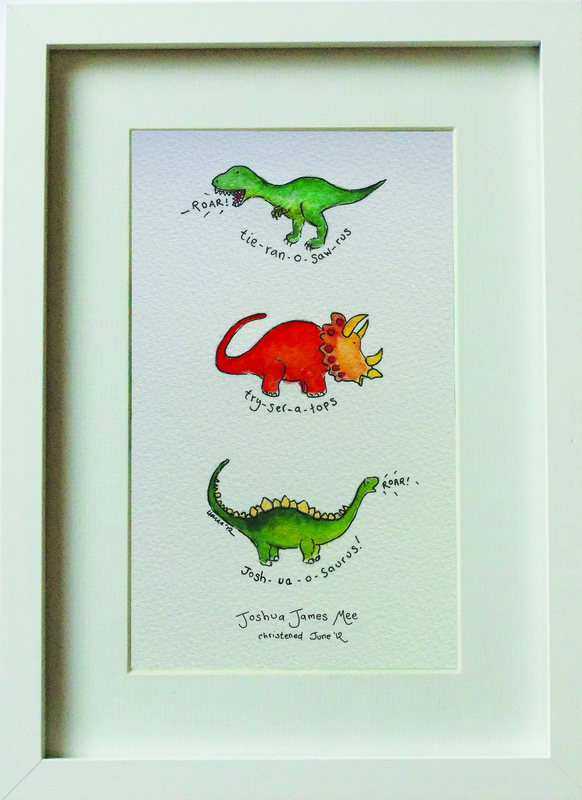 and so the request was made for a christening framed painting but with dino’s. Not too scary but fun! This was the result which I was very chuffed with (and so was my lovely customer) and I hope is loved by the little boys family as a keepsake of his very special day! Commissions taken and can be personalised with childs name and details.